Persistence Market Research (PMR) provides an exclusive analysis of the global photovoltaic glass market. The main aim of this report is to offer exhaustive analysis and provide insights pertaining to the photovoltaic glass market. This report offers a comprehensive analysis of the global photovoltaic glass market in terms of market energy consumption (kW) & value (US$ Mn) and year-wise (Y-o-Y) growth in sales of photovoltaic glass according to product composition and end use. For better understanding of the market, this report is loaded with analysis of factors such as drivers, trends, restraints, and their impact on the market revenue growth. The report is segmented into three sections viz. by composition, by end-use industry, and by region, to offer deeper insights on the global photovoltaic glass market. Regional analysis of the global photovoltaic glass market covers the seven key geographies of North America, Latin America, South East Asia & Pacific, Mainland China, Japan, Europe and Middle East and Africa. The last section of the report includes the competitive landscape, which presents the global market structure and revenue share analysis and provides information and analysis of companies based on categories of manufactures across the value chain and their presence in the global photovoltaic glass market. This section is intended to present report audiences with a clear dashboard view of the existing key player ecosystem prevalent in the global photovoltaic glass market. Market energy consumption is inferred through in-depth secondary research and validated from industry experts and key manufacturers/solution providers through primary interviews. Each interview is thoroughly analyzed and average market energy consumption is deduced and reconfirmed prior to incorporating in the report. For the market analysis, we have considered 2017 as the base number with estimated new photovoltaic glass sales in 2018 and forecast has been deduced for the years 2019 to 2026. The market size is calculated for different types of photovoltaic glass based on their selling prices in respective regions. Further, data points such as sales split, end-use split and regional split, along with qualitative inputs from primary research are incorporated in order to provide precise market analysis. The forecast presented in this report estimates the total revenue that is projected to be generated across the photovoltaic glass market during the forecast period (2018–2026). In this report, we have conducted forecasts in terms of CAGR and analyzed the market on the basis of Year-on-Year (Y-o-Y) growth in order to understand the behavior of the market and identify the various opportunities likely to emerge in the global photovoltaic glass market. Moreover, for better understanding of segmental growth, we have analyzed the global photovoltaic glass market in terms of Absolute Dollar Opportunity and Basis Point Share (BPS), which help identify potential resources and key trends in the photovoltaic glass market. Along with this, a market attractiveness index has been included, which provides information about the performance and growth of each key segment in the global photovoltaic glass market. Photovoltaic glass considered in the scope of this study is used in solar modules that produce solar energy. The cost of solar power panels is dropping at a staggering rate annually worldwide as a result of the narrowing gap between solar energy generation costs and other related costs, coupled with a number of governmental subsidies granted to photovoltaic companies and organizations in countries such as Peoples Republic of China and the United Kingdom. It is anticipated that the price for deploying solar power technology will decrease by 4% annually in the coming years, forcing countries to adopt solar power as a viable means of supplying energy. The installed cost of solar panels includes solar modules and photovoltaic glass, power electronics, mounting hardware, and installation. The decline in installation costs is largely caused by a decline in the cost of crystalline silicon, thin film CdS/CdTe and thin film a-Si that converts the solar energy into electricity. As the upfront cost is a major barrier for customer acquisition, further decrease in prices is one of the most important drivers for the global photovoltaic glass market. Europe and Mainland China are key regional markets for photovoltaic glass, with Europe dominating the global market in terms of revenue. Mainland China is likely to exhibit the highest growth rate during the forecast period, as is reflected by a 7.4X growth in terms of energy consumption during the forecast period. 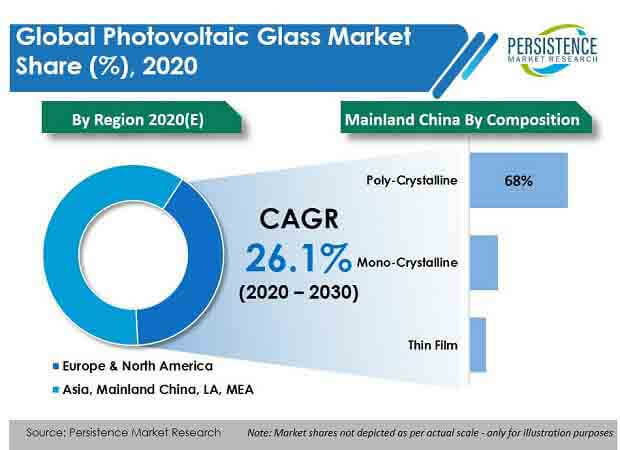 The Mainland China photovoltaic glass market is projected to represent significant incremental opportunity between 2018 and 2026, while the North America photovoltaic glass market is estimated to expand at a significant CAGR in terms of value – energy consumption over the forecast period. The markets in Latin America and MEA are still in the nascent stages and are expected to witness significantly low growth during the forecast period. The demand for energy and power across various industries in the Americas is anticipated to steadily peak in the coming years. However, global warming has created concerns among the population, and industries across the region are swiftly moving towards renewable sources of energy such as solar energy to reduce the carbon footprint. This is positively impacting the growth of the photovoltaic glass market across North America. Coal is the chief source of power generation in Europe, owing to the presence of extensive coal reserves in the region. Governments in Europe have implemented policies to increase the use of clean energy and reduce the generation of non-renewable sources of electricity production. This has promoted the use of photovoltaic technologies in the region. In Asia Pacific, the renewable energy sector is witnessing rapid growth, owing to significant developments in the energy and power sector in countries such as Mainland China, India, Japan, and Australia. Strong governmental policies pertaining to the dissemination of clean energy projects is acting in favor of the Asia Pacific photovoltaic glass market. The Middle East & Africa region has an abundance of non-renewable energy sources and as such, there are mixed approaches towards the adoption of solar energy as a viable renewable energy source. However, some countries of the MEA are proactively shifting towards photovoltaic modules, thereby placing this regional market on a relatively moderate growth path. Flat Glass Group Co., Ltd.
GUANGDONG GOLDEN GLASS TECHNOLIGIES LTD.